The GEnx, the fastest-selling, high-thrust jet engine in GE Aviation’s history, is being delivered today on the new Boeing 747-8 to Cargolux – the first customer delivery for an engine which has helped to define the next generation of GE’s commercial engines. Cargolux, a successful cargo carrier based in Luxembourg, is a launch customer for the GEnx-powered Boeing 747-8. Cargolux, with 13 Boeing 747-8 freighter aircraft on firm order, will take delivery of its first two aircraft today and tomorrow. In addition to powering the four-engine 747-8, the GEnx engine is also the best-selling engine for Boeing’s popular 787. Since its launch in 2004, the GEnx has received more than 1,300 orders with a list-price value of more than $17 billion for 47 customers on the Boeing 747-8 (GEnx-2B engine) and the Boeing 787 (GEnx-1B). As the Boeing 747-8 and 787 fleets prepare to enter service, the GEnx engine production is dramatically ramping up. GEnx deliveries are growing in 2011 to more than 140 engines, compared to 67 deliveries in 2010. In 2012, GEnx deliveries are expected to surpass 200. Based on proven GE90 architecture, the GEnx engine succeeds GE’s CF6 engine. Compared to the CF6 engine, the GEnx will offer up to 15 percent improved fuel efficiency, which translates to 15 percent less CO2. The GEnx’s innovative twin-annular pre-swirl (TAPS) combustor will dramatically reduce NOx gases as much as 60 percent below today’s regulatory limits and other regulated gases as much as 90 percent. Based on the ratio of decibels to pounds of thrust, the GEnx will be the quietest engine GE has produced due to the large, more efficient fan blades that operate at slower tip speed, resulting in about 30 percent lower noise levels. The GEnx will be the world’s only jet engine with both a front fan case and fan blades made of carbon fiber composites. 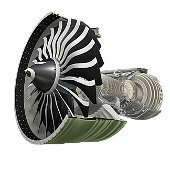 GEnx innovations are also being incorporated into new GE engines under development including the recently-launched GE Passport engine for business jets and the LEAP engine, the next-generation engine from CFM International, the 50/50 joint company of GE and Snecma (SAFRAN GROUP) of France.